but there are always people who prefer to do projects themselves. When those staunch individualists hit the carpet, disaster can ensue unless they have taken the time to properly educate themselves on the the carpet maintenance world. There are very specific processes and products which must be used, or the DIY carpet cleaning could destroy, rather than refresh, the carpet. While cleaning your own carpet will not cancel out the warranty, doing it incorrectly will. Using too much water or detergent are the two most common problems homeowners face, and can cause mold, mildew and backing separation. Water damage is one of the biggest risks of DIY carpet cleaning because if the carpet does not dry within 12 hours, mold and mildew can develop, ruining your carpet. Use fans, windows, vents and air conditioning to dry it as fast as possible. The other risk comes from using the wrong type of detergent or cleaning solution. Never use laundry detergent on your carpet, and make sure that all the chemicals can be safely applied without bleaching or dying the pile fiber. Choose the method carefully and follow the instructions. Hot water extraction using steam cleaner units are very popular with consumers. The right type of detergent becomes very important. Use a high quality pre-spray but do not increase the concentration. It will not make the rug any cleaner and may make it dirtier if the detergent cannot be completely removed. After the detergent sits on the carpet for 5-7 minutes, scrub it to loosen the soil buried inside the carpeting. Then use the steam cleaner with hot, clean water to rinse out the detergent and turn on the fan to dry your rug faster. 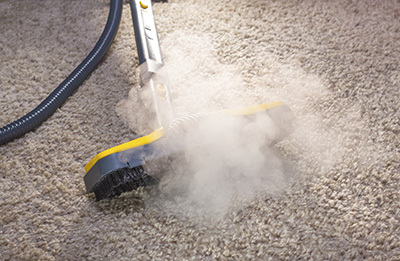 Dry powder cleaning focuses more on carpet maintenance, whereas hot water extraction seeks to thoroughly clean an already dirty environment. The powder, an organic material saturated with detergents, is applied manually and needs to be agitated then vacuumed out of the carpet. As it is picked up by the vacuum, the attached dirt particles will be vacuumed up as well. The third method involves dry foam cleaner. It is spread with a machine and brushed into the rug, then vacuumed out again. It is similar to the dry powder cleaning method because the dirt is pulled out of the carpet by the vacuum after sticking to the powder.